Home » How was the Chicago Portage created? How was the Chicago Portage created? To understand how the Chicago Portage was created we need to step back in time, back before the first people came to this land, back more than 10,000 years ago when the last glacier was melting back northward and uncovering a fresh landscape with new lakes, new hills, and new morraines with new rivers running alongside them. The people of the Chicago area live on one of the youngest landscapes on earth. Over the last million years several glaciers have covered Northern Illinois and the Chicago area. The last glacier reached its southern extent about 30,000 years ago and began melting back northward. It finally disappeared in this area about 12,000 years ago. The last glacier left behind a legacy of new rivers, gravel mounds, pothole lakes, and a ring of hills around the southern end of Lake Michigan that, for a while, separated the new great lake from the watersheds feeding the Mississippi River. A glacier acts on the earth it passes over like a bulldozer and a conveyor belt. The weight of the ice causes it to scrape up dirt, gravel, rocks and boulders as it moves over the surface of the earth. This collection of earth and rock is mixed into the glacier’s ice as it moves. The glacier conveys this mix called “till” to the place where it melts and drops the mixture. 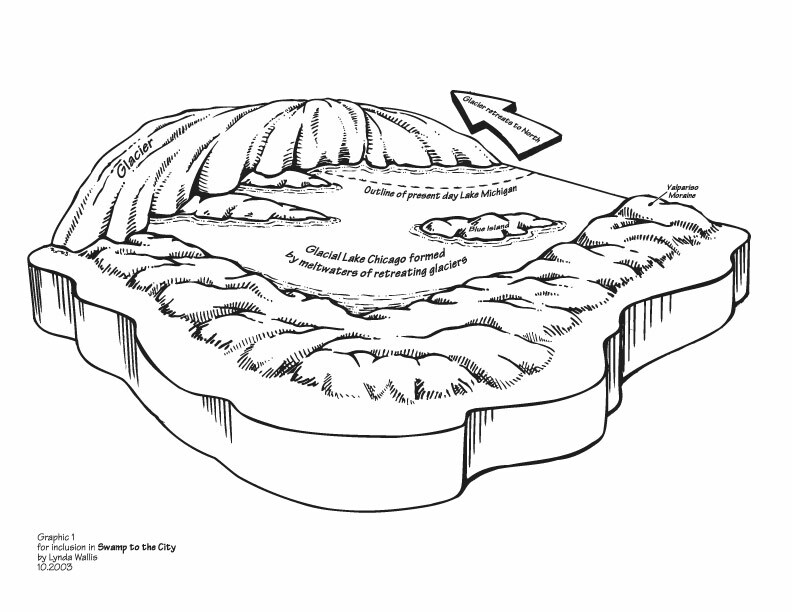 When the last glacier that covered Chicago reached its furthest extent, the face of the glacier remained roughly in the same place for about 2,400 years and the till it dropped built a large “terminal moraine”. This terminal moraine, known as the Valparaiso Moraine, appears today as a huge half circle of hills from northeastern Indiana, around the southern end of Lake Michigan and north along Cook County’s western border.